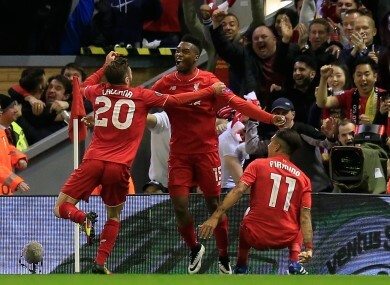 Goalscorers Daniel Sturridge and Adam Lallana celebrate with Roberto Firmino. DANIEL STURRIDGE WAS involved in all three goals as Liverpool impressively beat Villarreal 3-0 at Anfield tonight to set up a Europa League final date with holders Sevilla. Trailing 1-0 from the first leg, Liverpool levelled the tie when Bruno Soriano put through his own goal under pressure from Sturridge, who scored the second goal in the 63rd minute before helping to tee up Adam Lallana for a late strike that completed a 3-1 aggregate win. It took Liverpool into their first continental final since the 2006-07 Champions League, preserving Jurgen Klopp’s hopes of finishing his first season as manager with both a trophy and a place in Europe’s elite competition next season. Villarreal, for whom centre-back Victor Ruiz was sent off, had been bidding to reach their first ever major final, but could console themselves with the knowledge that following Sunday’s 2-0 win at Valencia in La Liga, their place in next season’s Champions League play-offs is already secure. Sevilla, seeking to win the competition for the third season running, won 3-1 at home to Shakhtar Donetsk for a 5-3 aggregate success. But for all Sevilla’s recent pedigree in the competition, Liverpool will approach the final with significant momentum, having previously seen off both Manchester United and Borussia Dortmund in the competition. Anfield was staging its first game since the new inquests into the 1989 Hillsborough disaster ruled that 96 Liverpool fans were unlawfully killed and a stirring pre-match rendition of ‘You’ll Never Walk Alone’, the club anthem, helped to electrify the atmosphere. There were early scares for the hosts when Simon Mignolet had to save from Mario Gaspar and Jonathan Dos Santos curled over, but in the seventh minute they levelled the tie. Nathaniel Clyne’s cross from the right was pushed away by Villarreal goalkeeper Alphonse Areola, but Roberto Firmino turned the ball back across goal and with the sliding Sturridge getting a touch just in front of him, Bruno contrived to bundle the ball into his own net. Shortly after, Lallana scuffed wide from James Milner’s superb, curved pass down the inside-right channel. Villarreal survived the onslaught, but the noise and early setback appeared to have rattled them and striker Roberto Soldado, formerly of Tottenham Hotspur, was booked after a series of indiscretions. After Philippe Coutinho, the tireless Milner and Sturridge had threatened for Liverpool, and Dos Santos headed over the bar for Villarreal, Klopp’s men scored their crucial second goal. Firmino miscued his attempt to larrup a left-foot volley towards goal from the edge of the box, but the ball ran to Sturridge, whose shot clipped Areola, struck the base of the right-hand post and rolled in. Having been left on the bench for Liverpool’s previous three games in the competition, the England striker celebrated with abandon. Ruiz saw red after a pair of bookings and with nine minutes to play it was all over as Firmino did brilliantly to reach the left-hand byline and cut the ball back for Sturridge, whose mishit shot was alertly poked home by Lallana. In Seville, where the tie resumed at 2-2, former Arsenal striker Eduardo gave 2009 champions Shakhtar hope by cancelling out Kevin Gameiro’s ninth-minute opener for the hosts. But Gameiro struck again early in the second half before a 59th-minute Mariano strike rubberstamped victory for Unai Emery’s side, who will go in search of a third consecutive Europa League trophy in Basel on 18 May. Email “Liverpool see off 10-man Villarreal to secure Europa League final meeting with Sevilla ”. Feedback on “Liverpool see off 10-man Villarreal to secure Europa League final meeting with Sevilla ”.